The Only Answer to Success contains a proven formula for changing your mind-set to that of a true "champion." Based on thousands of hours of research and personal experience, Dr. Leonard Coldwell has come up with a proven way to retrain your mind to achieve any goal or get through any challenge with zero stress. He will systematically show you how to change the subconscious negative mind programming that is eating away your drive and enthusiasm. He will also help you counter the negative influences of family members, friends, coworkers, the government, the media, and other supposed well-wishers that do more harm than good. After applying Dr. Coldwell's proven mind conditioning, you will retrain your mind to find success everywhere. You will be guided to success like a targeted missile. 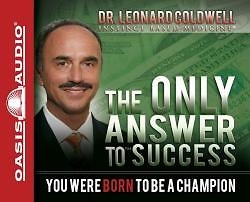 If you follow Dr. Coldwell's proven approach -- becoming successful is inevitable. You will truly have the only answer to success.